The Virgin Islands Shipping Registry has suggested that illegal anchoring is becoming more prevalent in at least one section of the British Virgin Islands. Acting Director for the Shipping Registry, Captain Raman Bala said boaters have developed the habit of anchoring in narrow channels and fairways leading into a port or marina, which, he said, is against the territory’s Merchant Shipping laws. He said several boaters have been anchoring in these narrow channels since the September 2017 hurricanes. Captain Bala said under the Merchant Shipping laws anchoring in these areas can lead to ‘serious penalties when enforced by the marine police’. He further said practising proper anchoring promotes the safety of navigation, saving of lives, preventing collisions and speeds up entry and egress from ports. Instead of moaning about it why haven’t the buoys been replaced then? how long does it take to replace them – its been over 9 months since Irma so no excuse really – its needs must if there are no official docking points! I agree – everyone is pushing hard to get the tourists back and the charter business going, but there is still a massive shortage of mooring bouys. But then everyone complains when they drop anchor. Can’t have it both ways. Drop anchor, yes just not in the inlet to the port, you are all blocking an entry way, no one said don’t drop the hook, well if you can! 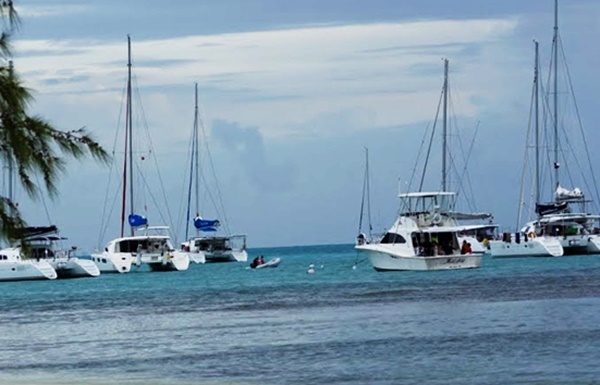 The BVI Shipping Registry’s work is visable, most recently they have gone online with their applications and now they are asking that boaters adhere to anchorage laws. What about the TRC? The TRC works alongside the Shipping registry in some instances but they are still there writing up receipts manually, they are too ancient in these modern times. Serious help is needed up there, they need to become more innovative. It’s bad enough with Credit Card Captains when there ARE enough moorings. “Open for business”?….. Indeed. Looking forward to seeing some proper markers in the channels…I wonder if this is shipping registry’s responsibility or the Ministry of Natural Resources and Labour or the Ports Authority. This needs to be clarified first and foremost. Markers in the channels are navigation aids and the responsibility of the port authority. There are many that have been replaced and many that have been repainted and reinstalled.